What is Polythene Sheeting and how is it used? 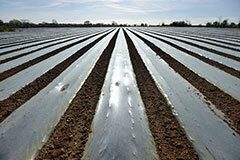 Polythene sheeting is a plastic film made from petroleum (you may also hear it referred to as polyethylene sheeting, poly sheeting, plastic sheeting, plastic film and poly film). It’s an incredibly versatile product used in a wide range of applications. Polythene is almost completely waterproof, though it will allow oxygen, carbon dioxide and flavourings to pass through it. It can be clear (transparent), translucent or opaque which makes it useful for a variety of functions. Polythene sheeting is usually sold in rolls (though it sometimes comes in boxes of cut sheets) and different additives can be added to vary its functionality, for example making it fire retardant, UV inhibiting (if it’s to be used outdoors), anti-static (good for use on printed circuit boards), high strength and high or low slip. It can also be made from virgin grade, BRC approved food grade or recycled polythene, or can even contain a volatile corrosive inhibitor to minimise the formation of rust on the item it is covering. It comes in various thicknesses, measured in gauge (the traditional imperial measurement) or microns (the European metric standard). The higher the gauge or microns, the thicker the film is. The different thicknesses are more suited to different applications. Light duty polythene sheeting is very thin, around 86 microns, and is often used as a dust cover or for protection when painting or spraying. Medium duty polythene sheeting is around 125 microns and is useful for general protection and to cover large items such as furniture. It’s also good as a floor protector when painting and decorating, and for general wrapping when storing or moving items. Gardeners often use it for cloches or ground warming. Heavy duty sheeting is around 250 microns and used when more robust protection is needed, usually in construction or industrial applications. It’s ideal for use as a damp proof membrane, temporary roof covering or window repair, for sealing off rooms or protecting countertops, and for protection against the weather, as well as for heavy duty wrapping during storage or transit. Polythene sheeting can be clear, coloured or tinted and comes in a variety of colours, useful for colour coding. It can also be printed on for branding or information purposes. Black plastic sheeting will hold up much better against exposure to UV light, and so won’t deteriorate as quickly as other colours in sunlight. The rolls of sheeting also come in a range of sizes (Abbey Polythene supplies rolls up to 4 metres wide). It can be centre folded or multi-folded for ease of use and storage and is sometimes supplied with perforations to make it easier to tear lengths of sheet from the roll. Punched holes can be added too, as well as micro perforations which will make the film breathable and prevent it from misting or fogging up. You can find out more about Abbey Polythene’s range of polythene sheeting on our website, or get in touch with us to discuss your requirements and for a no obligation quote.